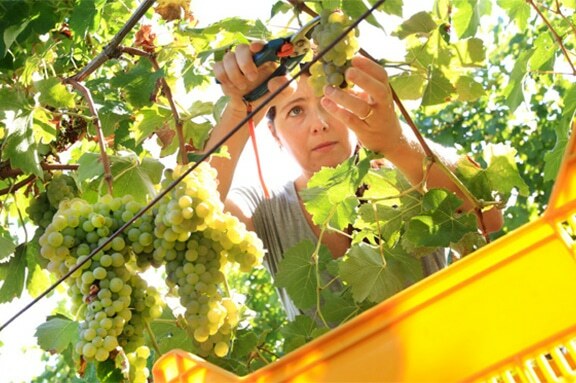 Above: Pievalta landed in the Slow Wine editors’ “top ten” wines from 2004 and 2006 in a feature devoted to Verdicchio and its ability to produce fine, age-worthy white wines. That’s Pievalta general manager Silvia Loschi in one of the photos that accompanies the piece. “Who says that Italian whites can’t stand up to the test of time?” ask the editors of Slow Wine Magazine in the current issue of the magazine (October-December 2014). For this superb profile of Verdicchio and the two appellations that produce it (Castelli di Jesi and Matelica), the editors parse the various subzones and soil types, the traditional and newly emerging styles for the wines, and the top producers working today. Out of 24 wines tasted from 2004 and 25 wines tasted from 2006, Pievalta landed in the editors’ top ten for both vintages (number 2 and number 3 respectively). It’s a wonderful piece and we highly recommend it to you (in Italian and subscribers only, unfortunately). RANKED NUMBER 2 IN THE TOP TEN WINES TASTED. There is a vibrant nose hiding behind the rich amber color of this wine. It’s markedly vertical in character, with notes of minerals, herbs, and anise that sing in harmony with the rich fruit flavors. In the mouth, the wine is lean, fine, and reactive. It shows how fleshy Verdicchio can be extremely dynamic in fresh vintages. The salty finish leaves lingering notes of candied fruit and anise. RANKED NUMBER IN THE TOP TEN WINES TASTED. One mustn’t be confused by the label: it reports a “table wine” classification, a designation owed to mere bureaucratic issues. There’s a lot of Verdicchio packed into this bottle. And it’s the kind of Verdicchio that’s hard to forget. An initial thread of aromatic evolution endows the yellow fruit, anise, and almond fabric of this wine with great appeal. The seductive mouth doesn’t weigh it down thanks to a salty weave that cohesively holds it together.